Two renovation projects for the winter / spring. The first is complete – a new section of wall to protect the inside bank of the moat. The second is new roof tiles on the west end of the house. This is underway now and should be finished in May. The tiles are a pale Cotswold stone. I asked whether we were going to put the yoghurt / cow manure mix used on the church spire stone to encourage lichen growth and to make the tiles as quickly as possible blend with the older ones. However we can’t do that up here – apparently the magic mixture would lead to an acidic run-off from the tiles onto the lead roof with possible corrosive damage resulting. So, we’ll have to be patient and will soon have a glaring new west roof, for a good five years or so until it mellows and weathers. Here are the tiles, sitting down by the battlements, biggest on the left (which go at the bottom), smallest on the right (for the top). Patiently waiting their turn to do a couple of hundred years of sentry duty. 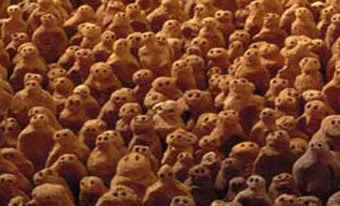 They reminded me of Anthony Gormley’s Field. This entry was posted on Tuesday, April 7th, 2009 at 2:14 pm and is filed under Broughton Castle.